I graduated on Saturday from Biblical Seminary’s MDiv LEAD program along with our cohort (except for a special brother and faithful reader who was missed), and others from the other worthy programs at Biblical (MA Counseling, DMin, traditional MDiv). It’s good to be done, as it was a demanding program. Being in full-time ministry (and a position that I truly care about), being a husband (a role I care even more about) and a new father (do I have to say it?) was quite the experience. I know this is true for most graduate students and may grace be given especially to those who have it tougher. I always felt that I was fortunate in a few areas (supportive wife, able to stay up late and function on minimal sleep, and overall, the support from many within our ministry). Finishing feels great but in truth, it feels great, because it was a great experience. As you can tell, I am very proud of Biblical and very grateful for this time. Here’s a bit of background for the sake of context. I graduated from Liberty University (Bachelors in Religion with Biblical Studies Concentration) in ’98 and also finished with a MAR from their graduate program (Liberty Theological) in ’99. If you know me, I go back and forth with my experience at Liberty; overall a good experience (met Susan and some great friends there) but I usually find myself saying something like if I could somehow guarantee marrying Susan, it would have been interesting to have gone some place else. I do remember graduation being the final hoop to go through as opposed to a celebration. 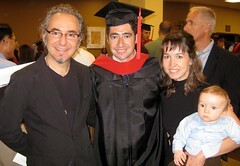 I had always planned on pursuing an Mdiv in my twenties but there was no opportunity to remain at my first church and study. So upon finally leaving, finding a church that would support me was big on the list just below one that valued healthy marriage (said with intentionality and a hint of playful spite ;-) As I mentioned during my graduation speech (one day I may upload it here) I also thought that I would have two or three children by my 30th birthday. After years of fertility treatments, altering diets, medications, it were syllabi of Newbigin, Franke, and Hirsch that allowed us to adopt and then conceive. Life never goes as planned. B. and what to do with it. Seminary has not “solved” that but has really helped in both areas. 2. I had too many suspicions regarding the Church, our theology, and our application, etc. A. more and more, I am convinced that the Church is in need of great reform. B. the emerging church conversation is essential to the future of the Church, especially our children and grandchildren. I truly see us X’ers and older Millennials (as well as prophetic Boomers) as the “bridge generation”. C. I needed a place to test-drive numerous thoughts, hear the insights of others, be challenged, be refuted, be inspired. … valuing my local context. … better theological and biblical foundation. … the new friendships made in Cohort 10! … better spiritual formation practices. … more hope for the Church, a better understanding of the triune God, a better follower of Jesus, and a healthier understanding of the Gospel. I know seminary is not for everyone, and Biblical may not be either, but for me, it was a great experience and I am very thankful for this season of life. I stopped doing the Monday Morning Brief thing because I thought it was too boring. I think only Marko and a few others can pull that off. Anyway, some of you kind readers have given feedback that you wanted some life-update stuff. So, for those who care, I’m renaming this to “Life Update” (the creativity is scary) and will post them with with no planned regularity. In case you couldn’t tell from the countless posts, I had a great time on our IME (International Missions Experience) trip with my seminary cohort. You can read all about the trip under the ‘Nambodia category if you are interested but coming home was also pretty cool. Susan does an incredible job and I was grateful for all the help my in-laws gave her. I have to say, I was relieved that Dylan remembered me (you know sometimes these little kids give you the cold shoulder when you haven’t been around) and Nathan gave me the biggest hug he’s ever given me. Great to be home and nice to be loved by the family. Pictured here is from my office door. Nathan and I went to the church office to say hello and pick my mail. 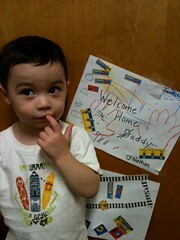 Nathan made a little welcome home picture for me (with a little help from our pastor’s wife – thanks!). I thought it was funny as I was going through my messages, he decided to peel the stickers off and take them back. I had a great time with my family this past Father’s Day. My parents, brother, sister, brother-in-law, niece and a few other dear relatives and friends had been away on a cruise. We met up at my aunt’s house and caught up. My niece has gotten so big and so cute. 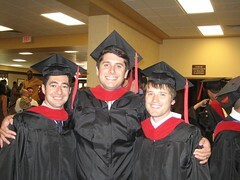 Well my time as an Lead MDiv student has come to a close. I had tried pretty hard to get to seminary over the years and the odd thing that I am realizing now is, I have enjoyed it more than I thought i would. I gained much more than I thought I would and I hope that becomes evident in some way in my ministry and my life in general. Really going to miss my cohort friends but that’s what Facebook is for I guess. In just two weeks and we’re headed back to NOLA. We are bringing a group of 20 students and 4 leaders and there are quite a few first-timers, I’m excited about that. 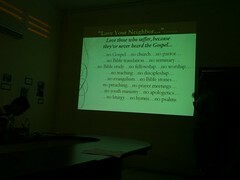 From a big-picture level, it’s been assuring to see this aspect of our ministry not just get more participants but adopt a healthier mentality of what missions is and how do we here in the ‘burbs live in response to the issues of our day and thus, how we share the truth, love and gospel of Jesus. So much more work to be done, in a number of these areas but I have been happy to see the progress. To God be the glory. First in one league – almost last in the other. Nope, I am not getting the iPhone 4. I don’t think I’m as early of an adopter or technophile as some suppose I am. Our youth ministry for this fall and our awesome youth leaders. Taking the boys to a minor league baseball game. When to post my NT Wright study blog posts. When is Evan and Amanda’s baby coming? I try not to blog too much about our children because I know it annoys people to hear how incredible their kid is. But I blog what’s on my mind, not everything of course, but a little bit, and being a dad has occupied a lot of my attention. So far, I’m told I’m a good one, a really good one. I ask our two year old all the time, “Am I a good daddy? He always says “Yes” and he gives me a hug and I give him a cookie. I’ve caught my wife rolling her eyes at that. I don’t know what her problem is, after all, she has a great father too. But I have been thinking about fatherhood quite a bit lately. This Father’s Day was my third one and it was also very special as it was the first for some dear people in my life – my brother-in-law, one of my cousins, and a few dear friends. 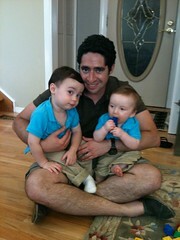 I remember very clearly my first Father’s Day, there was a lot of joy and I felt very grateful. Today has really been no different and I would say that I have enjoyed many of these moments over these last two years. In Pastor Sam’s sermon, he preached on a number of things while having the overarching theme of fatherhood. He reminded us that this is his first father’s day without his own father and he’s not sure if he has processed that. As one who enjoys a good relationship with his own dad, I was grieved by that. Further, I there were a couple of people throughout the congregation who had expressed emotion as we were discussing the topic of fathers. We all know it’s not an easy day for many but I was grateful that Sam felt the need to talk about it – we should always feel something when we come together in worship. Being in Vietnam and Cambodia was tough on all of us in some way. Most of us are married, many of us have children and all of us have close family and friends that we missed, not to mention demanding responsibilities. There was a quite a few times we wondered what was going on with the respective ministries we were a part of. We reminded ourselves that if they cannot function without us for two weeks, then we are not doing that great of a job to begin with. That line of thought, however, does not work with being a husband and a father though. And I found myself thinking about fatherhood quite a bit. 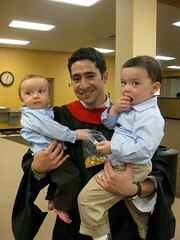 Not just because I was away from home but because this time in seminary is coming to an end, the boys are getting older and my wife has made numerous sacrifices as I have been studying and serving (I know this is true not only for all in our seminary program but for many in various vocations and contexts. Grace to you). I think one moment that stands out while I was thinking about this was on one of our long bus rides. For me, it was an excellent time to process and stare out the window and listen to some music. It’s interesting to hear some of Dylan’s protest songs having just been to War Museum and staring at the Vietnamese countryside. As you would expect, it sounds different. Other things sound different as well. I listened to Arcade Fire’s Neon Bible album. I love this band (even went to a concert by myself to see them play – they are so good live). For those that don’t know, AF is not a “Christian band”, though they explore a lot of spiritual themes. This album was recorded in an abandoned church that was converted into a studio (in Quebec) and I appreciate/agree with some of what Win Butler is frustrated with. In the song, “Intervention”, which is driven by a powerful organ, one lyric in particular gripped me, “Working for a church while your family dies” … “Singing Hallelujah with the fear in your heart”. I have heard this album countless times, have heard the lyric many times too, liked it, etc. it just hit me funny while being away and again, finishing this time of seminary. The song’s meaning is pretty open-ended. As far as I know, Win has not clearly explained what he was thinking when he wrote that. Throughout the album, many themes emerge as well as many different characters (politicians, parents, lovers, etc.). But that’s one of the things I appreciate most about music and postmodernity, you get to interpret for yourself ;-) I heard the words as if they were a prophet from the Old Testament and if you are similar to me, you know many pastors/missionary kids. Many of them have had fantastic family upbringings and many of them have not. This Father’s Day, I meditated and prayed that my kids would never feel that this lyric to ever be true for them. Here’s a good time for a point of explanation. The original purpose of us going to Vietnam was to accept the invitation by the government to interact with the Au Giang university students. As our trip leaders were planning, they realized that after this part of the trip was over, the possibility of a drop-off of purpose was likely so Steve and Miguel started to look into Cambodia. In addition to places of worship, they also planned to show us places where the Church is at work. I already mentioned the charismatic church but we also got to spend time with some excellent NGO’s that work for human rights and for fair trade. The first one we went to was Hagar International whose mission is: “Our purpose is singular; we restore broken lives. We welcome the toughest of human conditions. We stay focused on the individual. And we do whatever it takes for as long as it takes to restore life in all its fullness.” Originally it was begun back in 1994 by a business man visiting from overseas whose heart broke for the women who were outcasted and neglected. Hence the name – Hagar. A few years ago, they realized that boys and men were also rejected and needed a place of belonging. One of the director of operations gave a powerful and moving presentation on what they do. Most powerful was the picture of a teen-age boy who was talented and neglected. Her part of the presentation finished with her saying that her and her husband took in the boy and he is their “new youngest”. Loved it. This particular location was Hagar’s restaurant facility. Each day they put on an amazing lunch buffet, it was fantastic. The idea of the second chance is so powerful. We are accustomed to thinking that people who need a second chance are those that have committed a failure that they should have avoided but the more we listen to people’s stories, real stories, the more we see the evil tragic world that we inhabit and for some people, decisions are made for them that ruin their lives, shatter their dreams and pollute their future. I see places like Hagar the continued work of the Church – it gives people life – not just a trade, not just a career, not just a second chance, not just a religion but life (yes, it is connected to a couple faith communities now). The next person we met at Hagar was Nathan. I mention him because he had so much energy and his story was so powerful. I am guessing he’s in his mid-late twenties. He said he moved out to California to chase his dot.com dream that failed. While there, he accepts Christ as his Savior and feels the call of God to move to Cambodia where soon after, this opportunity to work at Hagar emerged. It ended up that he had some restaurant manager experience and before he knew it, he was running the food-preparation program. Once again, it’s people like Nathan, places like Hagar that is part of the new wave of missions and I was so grateful to see this part of the Kingdom at work. I have been receiving IJM emails for a couple years now and have wanted to connect some of their initiatives with our Second Mile Ministry, maybe now is the time. To the approval of some,they are more blatantly a Christian mission organization and while there was a bit of discussion on how that limits them, it was also great to see an outspoken ministry (Hagar’s website describes themselves as Christian too – just fyi). Those who know me, know I love the work of such NGO’s like Invisible Children (a non-profit that is not overt about their Christian faith) but I also love IJM. This is all great, the harvest is plenty, the workers are few, you know I love to see Christ-followers in plurality. I think the one of the most clear themes of this trip has been that when Christians are on the ground at work in churches, relief organizations, relationship building, and numerous other ways – great things happen. The Gospel is told, practiced, lived and proclaimed. I’m writing this on the plane heading back to the States. We just left Frankfurt and I am looking forward to getting home. So far it’s been a decent flight, a little bit of turbulence but nothing alarming. If this gets posted, we obviously made it through just fine. Just had a couple thoughts that I wanted to jot down before I not only forgot them but forget how they feel (which is often just as regretable). – This really was an excellent trip and to think, I almost didn’t want to go. We’ve joked a bit about some of the planning elements and the slow trickle of information but back at the end of 2009, I was really considering filing for a trip variance and going to Amaharo in Kenya and head up to Uganda. I’ve been wanting to go, interested in the Amaharo gathering (annual gathering provides of mutual learning for African and non-African leaders that build disciple-making communities with an emphasis on justice and mercy) and it would have been cheaper. However, I knew I did not want to miss out on this time with my cohort and as the plans for this trip unfolded, I trusted our leaders. Which brings me to Steve Kriss. Cool dude. In many ways, he is the right fit to lead this trip, part trip organizer, part professor, part normal guy, and part spiritual guide, his style really lends itself well. Also really glad that Miguel and Janel were able to come and share this time with us. – Lastly, I am really grateful for my family. I’m really excited to come home and seeing Susan and the boys. It’s only been two weeks and I know there are soldiers and missionaries (an odd pairing, wouldn’t you say?) that go much longer without seeing their loved ones and may grace and love fill their hearts. But I really can’t wait to see my family. I’m also grateful for my church, I’ve always have been. Though I know not everyone was on board with me going on this trip, there were so many that were really supportive, including our youth leaders and even my senior highers. (Yeah I miss them but only the ones reading this can know that, tomorrow night, it’s back to business as usual – God loves you but your youth pastor is a bit disappointed ;-). It was also funny to see a youth group from CA in our lobby yesterday, I hope they have a great and fulfilling experience). I admit that I am a bit surprised of the kindness that many have expressed to me and through Susan, and I really have been encouraged by that. I hope to finish up my posts on our time in Cambodia, add some pictures and fix typos in previous posts and knock out my NT Wright study this week and maybe even blog about a couple of things in the current Neue magazine. Hope you are well. A few years ago I tired applying the value of not criticizing someone else’s offering to the Lord. Born out of worship wars between traditional, contemporary, ancient, and progressive, complicated by relationships that I cherish ranging from my parents to my students, and moved by own experiences in private and corporate worship. Oh all that and processing the spirit of I Corinthians. IMHO, I think for some, unity in diversity is a really cool thing to say, but not really something to take too seriously. Otherwise, I think more would embrace the blessings of plurality. I write that with blood on my hands because during the charismatic worship service, unity in diversity sounded a lot better when I picture worship when David Crowder or my friends Glenn or Tim are leading (the quality is different but Crowder has been showing significant improvements over the years). I won’t get into the what’s and why’s of what made me uncomfortable but rather mention a few positive aspects of the ministry. One is that they are very community-minded towards the poor and suffering. They have numerous ministries geared towards that and I found that to be worthy in a community that had many needs. I also appreciated the extra service that they put on for young people on Wednesday nights that exist in addition to their Saturday and Sunday services. And from our time with one of the pastors, it really seems as though they genuinely care for people. That may sound a bit odd, I mean, most churches intend on caring for people but I sensed that they were very connected and appreciated that. The service probably had about 100 or so young people. Loud, energetic music, air conditioning and constant calls to pray stood out as most memorable to me. Steve noted, similarly to our experience at our second mosque, there was always a call for prayer. That seems to be one of the basic elements found in all faiths – the desire to connect to the One who is greater and not of this world. Don’t get me wrong, because of Jesus, I am not a universalist, and I know the religions of the world argue on which deity, the attributes, the mission, etc., but I do believe the God who made the covenant with Abraham, is the one our collective heart searches for. Lastly, say what you want about the charismatic church movement (this coming from one with a lot of skepticism in regards to how some express their sign gifts), one thing is for sure, this church is drawing people and many of them are being introduced to Jesus. I don’t think that’s pragmatic, I think it’s a reflection of the Church culture in the Global South (see Phillip Jenkins if interested). It was good for me to see that. We attended two Christian worship services on this trip. The first was a traditional state—registered Vietnamese church. The service was pretty full, I estimated about 250 or so. The sanctuary was split , projector screen (yep, PowerPoint is everywhere) of the stage, Eucharist in the center and the keyboardist and piano on the right. They had a special service commemorate the start of summer. They were dedicating this season to the Lord and broke out the fine china. Meaning the choir gave a couple of numbers. I thought wow, we can barely get a choir together for Christmas, they got one for the beginning of summer! I’m not a big choir person (I don’t even watch Glee) but I thought that was interesting considering we in evangelical west seem to slow down our ministries for summer where we could use that time for study and renewal from the hectic pace the school year demands of us. The message was on Mathew 5 salt and light and the pastor’s thesis was that Christianity is good for the community and they must serve the community and bear witness. This makes especially good sense given their communist context. Miguel likened it to Tertullian arguing that Christianity was good for the Roman society. Though we all didn’t see that way, I think Miguel makes a worthy point (besides a hesitation or two, I like the subversive nature of it). There was singing, there was the Lord’s Supper, there were a couple of things I’m sure I missed and while we don’t know Vietnamese, we did join in a couple of songs including the doxology. Further, it’s when we are in a foreign language worship service that we “close those eyes” and worship with our other senses. I did a good bit of reading Matthew and the Psalms, spent a good while praying quietly and I loved that the Lord’s Supper is understandable in any language – it’s universal, Jesus is for all people. The inside jokes along the way These are quotes said by or @ our team member. Anyway, I digress but I mention that because this family group has become part of the trip. They are about 12 of them consisting of about 5 adults and 7 young adults. All blonde, sunburned, tattooed, and three of them have dreadlocks, so they pretty much look like my family, minus the father walking on the boat with a cooler of beer. Everyone meets many people as they travel and of course and in 99% of the time, you never cross paths again. I was caught a bit off guard when I was walking through the Genocide Museum and walked into them. It’s a quiet place and everyone walking through is obviously overtaken with the sheer depictions of evil and pain but we still managed to exchange hellos. 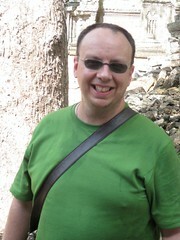 A short while later, I was in a different building and bumped into one of the older adults, Mark. I imagine he’s in his late 40’s/early 50’s, muscular build, balding, and a couple of tats on the biceps. We traded some of the information we had and then he said to me, “This is my fourth time here and every time I come, I get so choked up.” It was a nice conversation between strangers. Anyway, I have been looking for a couple of gifts that I can buy so that people can say thank you upon my return and thrown them in a closet afterwards and so far, I haven’t been that lucky. I was looking really hard for Susan and the kids. I saw some brand name clothes but that seemed a bit lame to go all the way to Cambodia and pick up a Hilfiger shirt. As I was walking through, I heard some English, “Let’s see what they have over here” and it was in real American English. I turned and saw a mom, a grandmother, and a cute 7 year old girl. Can you say – missionaries? I turned and said hello and conveyed made my excitement to run into other Americans. They were immediately conversational, very sweet, which only added to the missionary theory. I explained that I was looking for souvenirs for my young boys and her answer gave evidence to her knowledge of the market. She told me where there were some cute puppets (turn by the Buddha statue on the end there …) and that’s when I was really sure because a non-missionary mom walking with her mom and daughter would have suggested the duty-free rum in the Singapore airport. I know I take a while to tell a story, I’m a bit tired here. But I asked how long they were in Cambodia and she told me that she lived there. “Oh wow, why?” “Well, we are Christian missionaries.” (I’m so prophetic). “That’s great, I’m a pastor and I’m here with my seminary …” (She’s probably thinking, “Yeah, I spotted you a mile away”). Anyway, turns out they have been here for the last 7 years and the grandmother had been visiting. This child was their oldest and the other three were born here. We talked for a few minutes, wished each other well and I walked away encouraged for their work. Every country needs mission work (including ours) and I was so grateful for this family. May the Spirit heal and move in Cambodia through many ways from the NGO’s that we are visiting tomorrow to the missionary families like these. Our guide in Cambodia is a charming Muslim woman that has become an unofficial member of our group. She’s been great to us. Like normal groups, she has taken us to the Killing Fields and such but there was a handful of places that we went to that were not on her regular itinerary, Hagar Missions, International Justice Mission, a Christian church (a charismatic one at that – and yes, I’ll try to post on that experience). It’s been interesting in seeing her reaction. She took us to see one of the mosques and arranged a time with the imam. She even brought us to meet her family in her home that was under renovation. We were the first group to come into her home. They told us the story of how her father escaped execution of the Khmer Rouge, sadly his brother and oldest daughter were not as fortunate. There have been a couple scenes that a couple of us have talked about. She has expressed moments of emotion when coming to the mission presentations. The one I caught was her tearing up when reading an International Justice Mission 6 page brochure written to trafficked women. It said there’s hope for you – we can help and provided a number. From where I sat, that was probably the most useful gospel tract I’ve seen. We did not get a sense of any social justice being done by other religious groups (I’m sure some do though) , but in all the Christian ministries we visited, they articulated that the Gospel of Jesus compels them to care for the suffering. I’ll write more later of on that last part on the posts related to Hagar and IJM. All is well, hope you are to – thanks for your prayers – see you next week. I know this is a long post, feel free to skip to the third paragraph if you don’t want to read the context (but the post was prayerfully therapeutic for me). 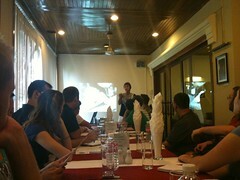 We grabbed lunch after our arrival to Cambodia and then headed out to the DC-Cam Center. It’s an NGO with the purpose of remembering the genocide by documenting the myriad crimes and atrocities of the Khmer Rouge era and bringing those responsible to justice. We received a thorough overview of the work and were took a tour. In one room, they were converting all the data to microfilm and expressed that they will eventually upload it online for everyone to have access to. They have staff dedicated to fundraising, a tech department, a team of writers that produce a lot of their own literature, books, brochures, magazines and they even have their own printing press. As we were climbing the stairs, a younger distinguished gentlemen who asked us what kind of group we were. We gave our introduction , we are a seminary, religion students, yada, yada, and he said, “Religion students huh; Let me tell you a story …” He was sharp, well-spoken, had commanding attention and to summarize he basically said, “Religion in the face of genocide does not offer much.“ He gave us the horrific numbers (some estimate up two million people killed by the Khmer Rouge), he told us about the Cambodians’ suffering, he told us that his sister that was taken by them and we all understood why he was angry (as one who could not imagine if such a thing happened to my sister or bother, I grieve with him). He wanted justice and it seems very clear that he is channeling all his energy to that cause (we later found out that he is extremely influential, very accomplished, and is doing great work in light of the genocide). He said that forgiveness to him was prosecution of those responsible for this atrocity. And while he admitted that his mother was able to forgive (and that she was religious), he was looking for something greater, something more. Everyone wished we could have had a one-on-one conversation with him but this was not the time. Our brother Tom, thanked him for sharing with us and offered his sympathies on our behalf. We knew that this was no time for a one on twenty debate and that listening was the appropriate response. Adding to the irony of it was a sizeable framed poster that hung on a wall to his right that was for an exhibit entitled, “Forgiveness and Reconciliation”. Wendy asked him about that and he quickly dismissed it as just a theme for an exhibit and reminded us that forgiveness was seeing the guilty come to prosecution. He used the example of Khieu Samphan (aka the Duch) who is the first of the infamous 5 to go to trial (the others are dead or in hiding). As the story goes, he becomes a Christian after going into exile, confesses to his heinous crimes, is arrested, provides an enormous amount of information for prosecutors against the remaining Khmer generals and asks for forgiveness from the countless Cambodians whose lives he destroyed. I need to do a little more research into this but at first glance, it seems that his Christian conversion led him to take responsibility for his crimes. (Sorry I have a poor internet connection and want to quickly post this so I can skype with my wife. I may try to add links when I get back. Til then, there’s Google). One of the greatest truths one can gain from Christianity is the understanding of forgiveness. It is only when we as fallen, depraved people take responsibility for our evil actions, our sin, our brokenness that we can experience the beauty of God’s forgiveness through the sacrificial work of Christ. I find that to be an incredible feature to this complicated story but I would still feel this way even if Samphan remained Buddhist. I wanted to ask the articulate gentlemen what he would do if the prosecution does not render a decision that meets his demands of justice? Or worse, what if the tribunal acts unjustly? This is not to say that Samphan should be acquitted because of his Christian conversion, that is certainly not my case at all (he is seeking release and may God give wisdom to this tribunal) but my only point is if God can forgive him, so can we. Further, I am more interested in the fate of his soul and where he sits in our memory than the fate of his remaining years in this life. Whether he be found guilty or not, he can be forgiven. Forgiveness is the path to freedom in many ways. It liberates us from our depraved fate of being aliened from God, it allows the only possibility for reconciliation between those who we have committed evil against and seeking forgiveness is the only response one can make to the Risen Christ who suffered for all of us so that we may be redeemed. It’s in that light that religion can stand in the face of genocide.